Pinyon and juniper trees, demonized by ranchers, miners and water mining entities, are being eyed by Chinese “biomass” companies with the backing of politicians. Recently the Nevada Pinyon-Juniper Partnership, aided by USDA, set up a conference to discuss pinyon and juniper trees. 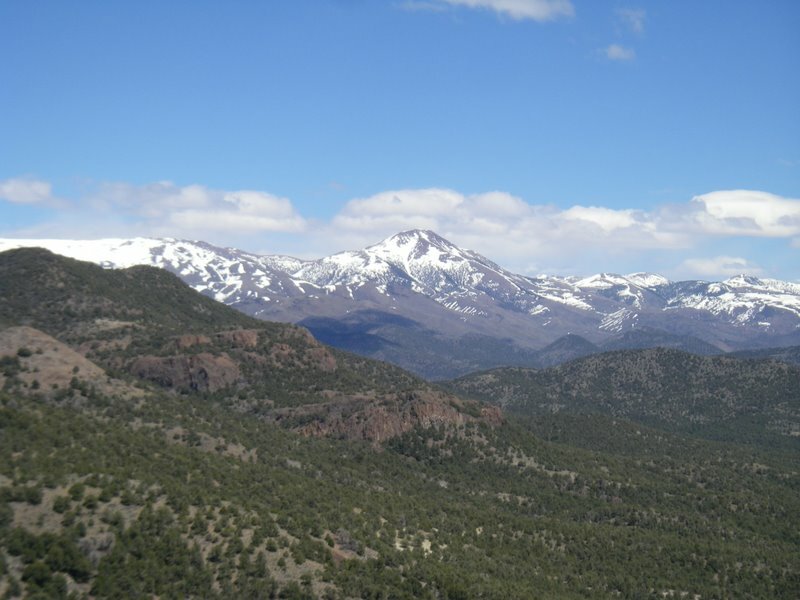 At the conference were several players in government and business who have an interest in the removal of pinyon and juniper trees in the Great Basin. Bob Abbey, the director of the BLM, attended the meeting. Most people don’t think of the Great Basin when they think of old growth forests but the pinyon-juniper forests there are ancient forests with several hundred year old trees that provide important habitats and food for many species of birds like pinyon jays, Clark’s nutcrackers, black throated gray warblers, small mammals, nesting raptors. The charismatic seed-caching Clark’s nutcracker faces catastrophic food shortages in the Rockies due to whitebark pine die-off. It relies on large-seeded pines – and the pinyon pine has a superb large seed that was also vital to supporting Native American cultures in the Great Basin. Harry Reid gets surprisingly easy victory. Dems keep Senate. GOP wins House big. One tidbit on the wolf issue. Chet Edwards, a Blue Dog Democrat from Texas, author of the most anti-wolf bill in Congress lost big. It is doubtful his bill was much of a factor. Montana ballot initiative I-161 which we discussed for a long time here, passed. It prohibits the current system of outfitter-controlled non-resident hunting licenses. Leaving Las Vegas: Will Sharon Angle turn out the lights? Will the resource-sucking “sin city” be reclaimed by the desert? Everyone knows at least a little bit about Las Vegas. To many visitors, Las Vegas is Nevada. In terms of population this is almost true. The large majority of the state’s population lives in Clark County (Las Vegas) — almost 2-million people live in this small southern Nevada urban area. Reno is the only other major population center. There is the real Nevada. It’s a land of vast deserts (both hot desert and cold Great Basin desert). Over a hundred mountain ranges bisect the desert basins. Scenery is wonderful, although it is not the classical jagged glacier peaks and deep forest. Population density is very low. Best of all, almost 80% of the state is public land. You don’t have to ask permission to use it. On the other hand, it is not pristine land. Most of the land is grazed by cattle, although Nevada is regularly held up as an example of the poorest grazing land in America. Much of north central Nevada is being torn apart by vast gold mine pits that spew their poisonous mercury upon the residents of Utah and Idaho. The gold pits are late comers to an earlier era of mining that created towns like Searchlight, Nevada. This is a blockbuster decision for the high desert of Nevada and western Utah and against the same old pattern of urban sprawl for Las Vegas. The state supreme court could yet rule for SNWA. It’s a big loss for Harry Reid and Pat Mulroy; and, of course, the developers. PIPELINE PLANS: Judge kills water ruling. Permission for agency to tap three rural valleys rejected. By Henry Brean. Las Vegas Review Journal. Ooops! Judge: No SNWA Pumping From Cave, Delamar, and Dry Lake Valleys. WaterWired. ♦ This decision and its importance was a little slow to dawn on the major newspapers. The Las Vegas Review Journal got it right from the start, however. The Las Vegas Sun, “sin city’s” “liberal newspaper” doesn’t seem to have covered it yet. New 10/29. Nevada ruling could burst Las Vegas pumping plan. Snake Valley » Judge blisters official’s decision favoring Vegas. By Patty Henetz. Salt Lake Tribune. [this] “could doom Las Vegas’s plan to build a 300-mile, $3.5 billion pipeline from Snake Valley, which lies mainly in Utah, to the desert megalopolis. An interesting story from basinandrangewatch.org. Here is s.22, ” The Omnibus Public Land Management Act of 2009.” This replaces the 2008 version I had up. They are debating it this weekend. Republicans are filibustering. Last Congress the omnibus measure passed the House, but failed due to Senator Coburn’s filibuster at the last minute in the U.S. Senate. Majority Leader Reid said he would bring it up again without having the bills inside this “omnibus container” having to start at square one back in the committees of the two chambers of Congress. Regarding Idaho, this contains the controversial Owhyee Initiative.